Last week, we accidentally got a couple achievements while doing heroic Ulduar, so my push towards 7,000 achievement points is going strong. It started on Ignis - I was on construct duty, so it was my job to blow up the constructs when they became brittle. However, one of them got out of my line of sight behind a fire pillar (I just lost track of it), so when the call was made, it was too late for me to go shatter it. Our awesome offtanks quickly picked it up again, made it brittle, and before you knew it, when I shattered one construct, the other one that had been awoken by Ignis was shattered as well. So there we had Heroic: Shattered. We continued on and we reached Kologarn who refused to let us pass. Normally, we focus all DPS on the right arm and down him that way, but recently we've found that just as he's about to die, his left arm has been DPS'ed enough via incidental damage (swipes, consecrates, death and decays, etc.) that if we just add a bit of DPS to kill the arm, all that damage is transferred to Kologarn and he goes down quicker. So when I saw we were close to killing Kolo and I saw that his left arm was getting low, even when the right arm popped up, I focused DPS on the left arm, knowing the call to kill the left arm would come when the right arm went down. With the extra damage I was able to provide to the left arm before the right arm went down, we were able to get Heroic: Disarmed. Of course, while striving for achievements, I'm still doing my Crusader dailies each and every day (actually, Saturday was the first time since the patch that I didn't get my dailies done - ale comes first). A day before though, while out there, I found my evil twin! Finneal (achievement comparison) was there and he looked almost exactly like me! Just with more achievement points! I can't let that stand. But we did have some fun and we both popped our mirror images just to confuse some people and seeing eight little dopplegangers running around was a sight to be seen. Lastly, last night, I went into a quick VOA since I really didn't have anything else to do and even though I don't need any items from there, it was fun to do single target DPS. Usually in Ulduar, I have to do crowd control, DPS some bomb bots, or just do things that don't allow me to go all out. 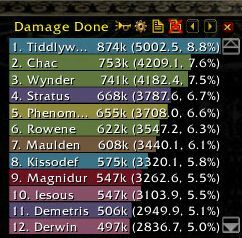 Well, on both Emalon and Archavon I was pretty much free to do as much DPS as I could and it showed. I easily topped the damage meters and was quite happy with my performance. And all of this was done without an enchant on my purty new Runescribed Blade. The image of you and Finneal is priceless. So this is the other mage gnome who has more achievement points then you and looks like you, i wonder who is trying to copy who. :P jk haha.